I actually enjoyed the food shopping run this morning. Regulars to this blog will have picked up on the fact that I hate, loathe and despise food shopping. I strongly favour a return to prehistoric times when the man went out and got the food. Killing a mammoth must be a walk in the park compared to dealing with doddery drivers causing unnecessary hold-ups in the carpark by going for that really tiny, awkward space, gossiping shoppers blocking aisles and uncooperative sales assistants. But today was different. Caiti and I hit Intermarché at La Châtre which is definitely my favourite big supermarché these days. The store loudspeaker must have been tuned into an oldies music station because there was some good music from the likes of Suzanne Vega, Queen, Train, REM that I could sing along to as I shopped. No, I’m not self-conscious. I just smile if fellow shoppers give me startled looks. Nice music really helps. Sadly our handy nip-in store, Simply Market in Boussac, sticks with France Bleu Creuse which features a lot of accordion music. Need I say more? Caiti is a good shopping buddy. She doesn’t disappear to the far end of the store with the trolley when I’ve got my arms full of milk cartons, flour, sugar and other heavy, bulky essentials, unlike other family members I could mention! She doesn’t try to brainwash me into buying Beyblades and start sulking halfway round when I say no. However, she does slip the odd surprise item into the chariot. Today’s was caramel crisps. Yes, you read that right. 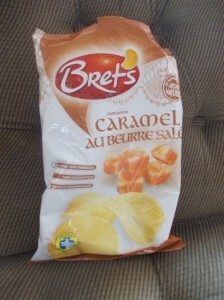 Here they are – caramel flavoured potato chips. And they really do taste caramelly. Now, whether that’s a good thing or a bad thing for a crisp, I’m not so sure, but they do. 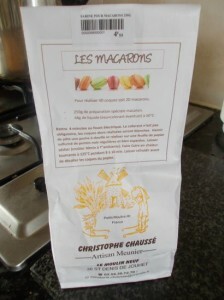 They’re made by Brets in Brittany. I went to the website at www.brets.fr but that is under construction – so says a message dated November 2011. It doesn’t look like Brets are very high tech or good at social media. So sadly I can’t give you anymore background about these innovative chip makers. Shame. Cat Scans And Beyond: Unusual Pet Portraits Olympic Games – Who To Cheer For?